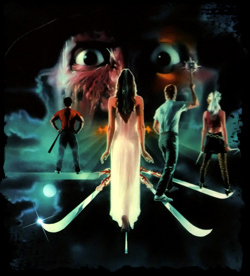 Freddy Krueger’s remaining victims team up to fight the dream-stalker in A Nightmare on Elm Street 3: Dream Warriors. 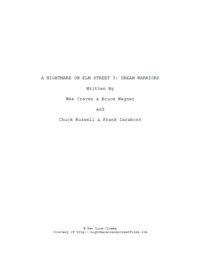 Two scripts are available here: the original by Wes Craven and Bruce Wagner, and the rewritten version by Chuck Russell and Frank Darabont. The script by Wes Craven and Bruce Wagner is a website exclusive! New Line Home Video included Chuck Russell and Frank Darabont’s draft on the DVD released in 2000. 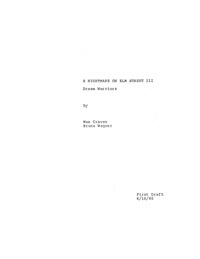 Both scripts are in PDF format. After the financial success of A Nightmare on Elm Street 2: Freddy’s Revenge, New Line Cinema approached original Nightmare creator Wes Craven to participate in a planned third entry. “They came back to me for number three and asked me if I wanted to direct,” recalled Craven. A quick glimpse of the Little Girl vanishing around the corner at the far end of a long, twisted corridor. The walls are streaked with rust…or perhaps dried blood. She keeps following. Being led. Kristen comes around a corner and finds herself facing a heavy steel door that is just closing with a SOLID METALLIC CLANG. The riveted metal seems out of place in the rotted wood house. Kristen goes to the door and pulls it slowly open. A stairway leading down into darkness. Kristen carefully makes her way down the metal steps. Kristen fearfully enters Freddy’s decrepit lair. Ancient rusted boilers stand cold and silent in the shadows. The SOFT JINGLE of the tricycle draws Kristen’s attention. The Little Girl pedals out of the darkness and comes to a stop before Kristen. This is where he takes us. A large ornate oval mirror hangs on the wall. The glass EXPLODES as Nancy bursts into the room. She rises, staring in horror and disbelief. The horrid Freddy/snake expands and contracts around Kristen, slowly wolfing her down, its awful diseased maw inching up past her waist. NANCY snaps into action. She scoops up a long jagged shard of broken mirror, cutting her palm in the process. She leaps into the fray, jamming the shard of glass into Freddy/snake’s eye — the eye bursts, spraying rancid ichor. Regurgitating Kristen, the creature arcs back, ready to strike. His good eye locks on Nancy, recognizing his old enemy. Neil is momentarily distracted by another swell of BUZZING. A fly brushes past his face in the darkness. You said something before… about laying him to rest…? You must find the remains… and bury them in hallowed ground. The nun turns and climbs the stairs. He moves to follow her, but his foot comes in contact with something near the bottom of the steps. The BUZZING SWELLS UP LOUDLY. He jumps back. The grisly carcass of a cat stares up at Neil, hundreds of flies swarming in its desiccated flesh. Pausing at the top of the stairs. If your only faith is science, Doctor… it may be you that’s laid to rest.